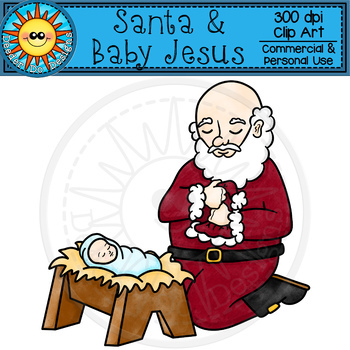 This Christmas clip art product includes a single image of Santa kneeling at Jesus' manger. It comes in both color and black and white for a total of 2 pieces. These images can be used for personal, educational and commercial use. No extra licenses need be purchased. All images are in .png format, with transparent backgrounds so they can easily be layered. All images are saved at high resolution, 300 dpi for easy resizing and to maintain crisp lines when printing. 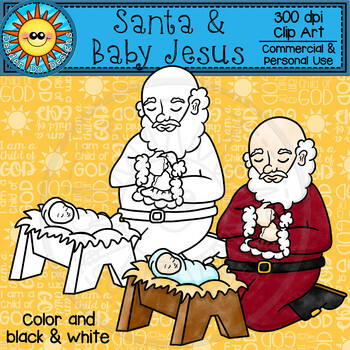 See the preview to view a high resolution image of the clip art pieces. Please give credit back to my TPT Store for images used in your commercial products! **I love to see my images in your projects! So don't forget to give me some feedback love, and let me know how you've used them, what you like about them, and how I can improve them!! Looking for more? Check out all of my Christmas products!